When people hear gymnastics, they tend to think about the Olympics. Well, the truth of the matter is that you don’t have to be a professional athlete to do gymnastics. In fact, doing gymnastics can help you in several ways throughout your training. In this article we will be covering ten exercises that you can do by using gymnastic rings. Doing pull-ups on gymnastic rings is great method for building strength and getting a good workout for the back and arm muscles. 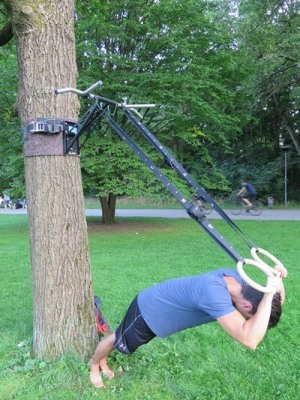 To start the exercise, adjust the height of the rings accordingly and stand underneath them. Then, grab the rings with an overhand grip and begin pulling your upper body up. 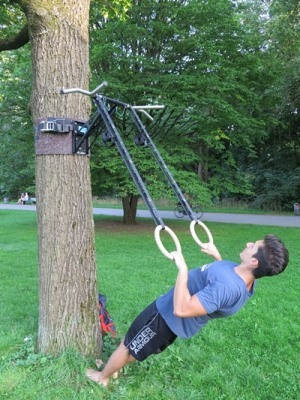 Notice that you’ll need to hang vertically from the rings before starting. Once you reach the top, we recommend you to hold this position for 3 seconds before getting back down. When doing pullups on gymnastic rings it is also important to keep your legs together, so don’t forget this detail! Ring dip is a very challenging exercise for most beginners but it can help you build a lot of strength. The catch is that more pressure is placed on the shoulders. Other than this, it is a great workout for the chest and back muscles as well as the triceps. The first step for doing ring dips is to hold your body up while holding on tightly to the rings. It is key that your posture is as firm and straight as possible in order to hold this base position. 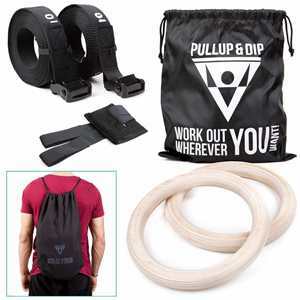 Next, while keeping your face straight forward, start doing dips and make sure that your biceps are touching the rings. Then, aim to fully extend your arms to get the most of the exercise and repeat. As we mentioned before, this is a challenging workout so make sure you are well-trained prior to taking it on seriously. More about our wooden gym rings! To do muscle-ups on gymnastic rings you need to divide your exercise in four steps. First, grab the rings and stand underneath them. Second, pull yourself up to the point where your head passes the rings. Third, transition yourself by switching from pulling up to dipping. When pulling up make sure that your hand knuckles are facing each other. Once you do the transition they should be opposing each other instead. The fourth and final step is to dip. Note that this will only be achieved if you have transitioned properly. Doing ring rows can be lots of fun. Simply start by setting both rings to the proper height needed. Make sure it is not too low though as this will make the whole workout more difficult. Then grab the rings while you lay under them with your legs straight. An additional trait is to place your feet on a chair or something with height, which will add on to the challenge. 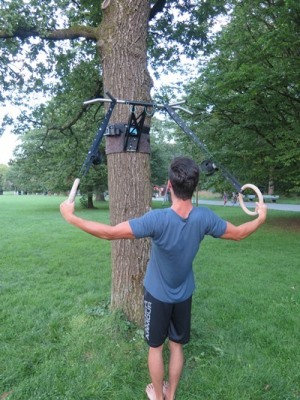 Make sure your arms are straight and then pull your chest up towards the rings. The butterfly exercise is at the border of advanced and intermediate levels. 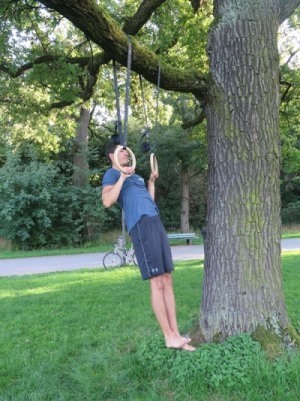 While standing under the rings, grab them (knuckles inwards) and hang from them with a straight vertical posture. Then, extend both arms to the sides as you transition your grip (knuckles outwards). Once you’re holding this position continue by pulling your body up while keeping your arms extended on the rings. We recommend lots of training prior to trying this exercise out as it is very demanding on the shoulder and arm muscles. 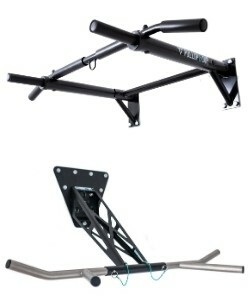 Triceps press or extension is a relatively simple exercise to carry out. Start things off by grabbing the rings while standing behind them. Then, as you are holding onto them, lean your body forward to the point where your head has passed the rings and both hands are above your ears. Simply press your arms forward to stimulate the triceps and do a set of reps in this position. Doing a knee raise involves raising both knees up as your arms are holding you up on the rings. This exercise focuses primarily on your abs in case you want to work on those. As with the previous exercises, it is important to keep a firm posture. Keep your legs together and move them in unison with each other as you’re raising your knees upwards. Recall the butterfly that we described earlier? Now let’s try the reverse of it. 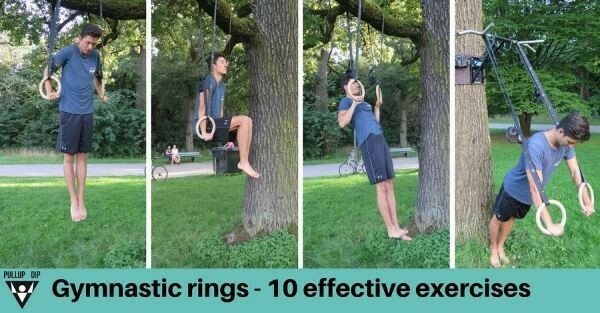 Instead of starting on top of the rings, try the bottom. Simply stand in front of the rings, giving yourself some distance as your body will be leaning backwards. As you grab the rings with a tight grip and firm posture, open your arms and pull your chest to the front. Make sure that you have good footing and keep your legs together. Doing lunges on gymnastic rings is an added bonus of sorts. 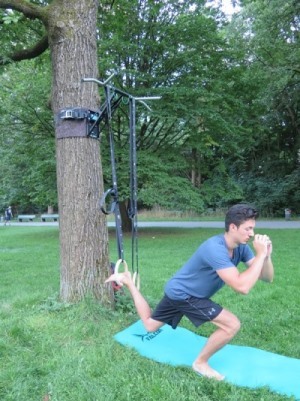 The idea is to use the rings as you lean forwards or backwards, which allows you to do lunges. If you want to work on our legs for example, grab the rings, lean backwards and bend one knee at the time. Doing ring bicep curls requires you to lean backwards while grabbing the rings as a first step (underhand). Then, with your arms straight, turn your wrists around to change your grip and curl. Make sure your chin remains up during the exercise and that your feet are kept together. Now remember, gymnastic ring exercises can lead to injury if you are careless or get carried away. Hence, we recommend to take things one step at the time and to take the proper safety measures when exercising. 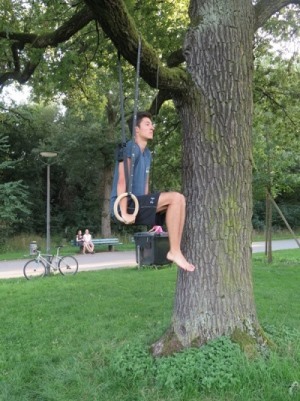 Do you want to train more gymnastic ring exercises? 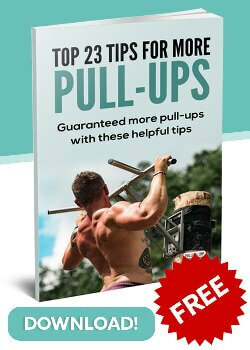 Then get our FREE eBook with over 120 exercises with the pull-up and dip bar, gym rings and resistance bands. Very good overview of exercises that are not tooo advanced. I am a big fan of your products, especially the rings I like a lot. 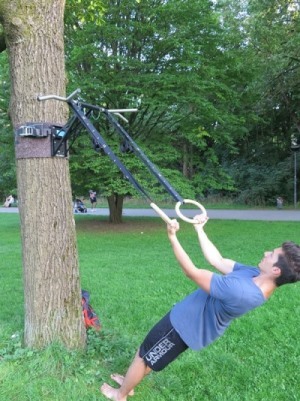 I have do say the ring dips are pretty difficult at the beginning as it is so much different than normal dips but once you get used to them and train them a few times it's getting much easier. Training with rings is more than easy. It takes a while until it works really well. Especially the deep muscles have to be built up first. If you stick with it, then the training is really very effective and almost unique.